Say hello to the new Skilsaw SPT99 heavy duty worm drive saw, which has an unmissable new roller stand. Their first portable worm drive table saw first came out 2 years ago, and has earned itself a solid reputation. It’s a decent saw, and often sold at a compelling price point. There have been some decent deals, and I’ve been on the lookout to see if there will be mentionable deals this holiday season. The new Skilsaw worm drive table saw is said to have an increased 3-5/8″ depth of cut and 30-1/2″ rip capacity. There’s also said to be a new precision rack and pinion fence system. I didn’t realize that before, and it’s worth repeating. This new Skilsaw worm drive has a rack and pinion fence system. This type of adjustable fence is found on Dewalt table saws, as well as Hitachi’s still relatively new table saw. I have found that, on portable table saws, I like rack and pinion fences a lot more than “unlock and slide” types. There’s also of course the obviously new roller stand, which features huge wheels and very large-looking floor pads. That actually sounds pretty useful. There are two versions – SPT99-11 comes with a Skilsaw blade, SPT99-12 is packaged with a Diablo blade. But wait, there’s more. You guys asked me to be on the lookout for a good deal, right? We asked Skilsaw, and they didn’t have much to share. But I just checked Acme Tool, and they have a freebie offer running now. Now, thru 12/31/2017 (unless supplies sell out sooner), buy the Skilsaw STP99-12 – this is the version that’s bundled with a Diablo blade – and you get a free Skilsaw 7-1/4″ sidewinder circular saw. They’re also selling the saw for $499, which is $80 lower than the MSRP of $579. You could wait and see what discount offer Cyber Monday brings, or opt for a free circular saw that’s valued at $100. It’s good to see Skilsaw continuing on their path to try new things. This new saw has big cutting capacity, both in terms of rip capacity and cutting depth, and just look at those wagon wheels on the rolling cart. 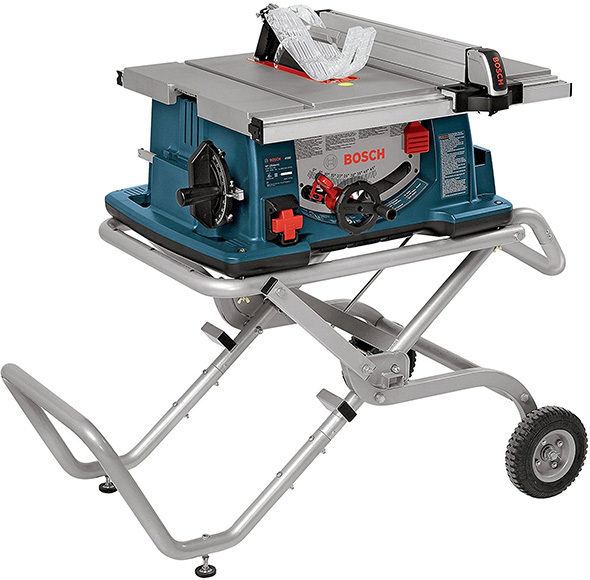 Have you ever struggled to roll a portable jobsite table saw over rocks, dirt, uneven terrain? Bigger wheels will help. This isn’t a space-saver saw, it’s a monster designed to compete with its biggest and most popular competition. I just have one request for Skilsaw. Please, pleeeeease make the next one cordless! We need more competition in the cordless table saw space. When I retired (sold up and out) , we were using Bosch 4100 table saws on their gravity rise stands as our jobsite tool. Having a rack and pinion fence would have been and advantage – as the Bosch fence needed some fine tuning in use. The gravity rise stand was a plus IMO – but big wheels like on this Skilsaw would have been nice. Rolling the saw onto a rough construction site or even a homeowner’s lawn is easier with bigger wheels. One thing I’d like to see on these saws is an extension table or wing in front of the blade. The Bosch had pull out wings to the left of the blade and in the rear – but like other jobsite saws – lack of space in front of the blade can be a nuisance. Ideally a pullout or pull-up front table extension would also provide a longer guide path for a miter gauge. You can always use auxiliary flat or roller stands, build a table with wings etc. but it would be nice to have something built-in. I tested one or two saws with extension attachments, and I don’t really like them. I do like to at least see them as optional attachments to saws; I don’t think it’s available for Dewalt’s rolling stand saw. If you look at the fence, it looks like it has the flip over device that Dewalt has on theirs. I am assuming these are built at the same factory/tooling. I don’t see the “free Skilsaw 7-1/4″ sidewinder circular saw” on the link for Acme, any special code etc? Click the link, add to cart, and the circular saw will be added to the cart automatically. On the product page for this table saw, there’s a banner image above the product, and then under the price and above “add to cart,” at least on a desktop browser, there’s a link with details about the free circular saw offer. Here’s the intermediate promo info page. It’s automatic. If you’re not seeing the saw added to you cart after adding the table saw, there might be a problem somewhere. Hope to see a similar deal on this unit to last year’s BF Skilsaw deal from Acme . It was $279 with Diablo blade, folding stand shipped, if I didn’t already own the lightweight sidewinder in Mg . I’m debating buying and selling last year’s model I think I can recoup most of my investment. New unit is more powerful 15A and has the R&P fence, but it’s 2X as heavy at almost 100# vs #47 and it also has a much smaller storage footprint. But if price/deal is right. I have the Rigid gravity rise stand that I use with my cordless Milwaukie. I will say that last year’s unit with stand isn’t bad and the saw is quite toteable, and it only takes 20 secs to setup , and you have to spend time mounting river knife, etc, just wish it had on saw blade storage. I’d like to see a “portable” table saw with trunions and a bevel adjustment crank. Portable is in quotes because I’d like to see it for more of the homegamer. Someone who wants a small saw that they can store easily in the corner and still get extremely accurate cuts. Portability would be an afterthough. I love my porter cable, it’s got the crank for adjusting the angle, but it’s not the most accurate saw. Me too. But at higher prices, users expect more features. So the table surface gets bigger, the motor gets more powerful, and then there’s the need for a bigger base. We’d bring one of our Unisaws to some bigger – longer duration jobsites and set up a real shop. If you have a big enough truck and riggers to help you move things, then most anything is portable. My home shop 1970’s Unisaw has a sliding table – so moving it out and around would definitely need some riggers to help. Getting my tongue out of my cheek, I can see your point. At one time it looked like manufacturers might be moving to make more so called Hybrid Table Saws – slotting them in between bigger cabinet saws and contractor saws or even jobsite saws. I haven’t made any survey lately – but the category does not seem to have taken off. I think Grizzly and Shopfox still offer them. If I were buying today, I’d be looking at a Hammer or Minimax (if I hit the Lottery) – but at 2400 sq ft. I’m not extremely constrained on space. I think my dewalt is remarkably accurate. 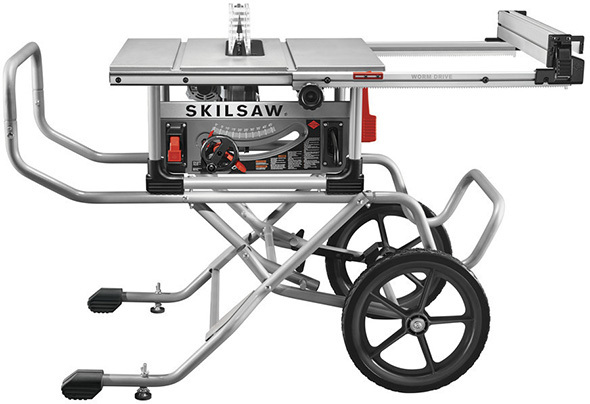 it’s the larger 7491 model – which is similar to this skilsaw model. I’m mildly shocked to see other companies using the rack and pinion fense and extension system. Shocked only that SBD didn’t trademark that or something. I do however like competition. Had this saw existed when I was buying the Dewalt I would have looked really hard at it and might have gotten it because it would have been a touch cheaper. I don’t like their stand. for me I don’t travel my table saw to many jobsites – when I do I can do so in the trunk of my car. If skilsaw would sell this saw minus that stand I would consider it. I don’t need or want all of that stand rot. I happen to really like the Dewalt X stand as it works fantastically and folds up against a wall. For the home owner person – it’s great. Can the SKILSAW SPT99-11 10″ Heavy Duty table saw be separated from the stand? Yes, but if so it needs to be securely mounted to a sturdy surface. PDF user manual via Home Depot – see page 27.